Thanks to everyone for contributing, spreading the word, and getting involved with the Real World, Real Food Organic Basket Challenge that Sonja and I did last week. It was so incredibly fun. A particular congratulations goes out to Kara for winning, but I think everyone who participated was a winner (of course!). There was a lot of heart and soul (and tummies) in the mix. It was a great experience to be involve with. As far as a wrap-up goes, I think the biggest take-away for me was the obvious differences in food costs across the country. Surprisingly, for the same grocery list, Kara (who lives in a fairly rural area) walked away with a lower grocery bill than anyone else who did the challenge from a big city. I was especially surprised that I had the highest bill, even though I am in the most centrally-located city (St Louis is the midwest after all). I for sure thought I would beat Sonja’s basket price, since I live in a mid-sized city that – from what I gathered – has a fairly low cost of living. But, I was wrong. There are some confounding variables, of course. For one, the list was the same no matter where you are. So, what is locally grown in one region is probably not available locally in another. And, what is easy to import in some places (like from CA to CO) might take a little more to get from the origin to a different destination (say, Michigan’s UP, or Missouri). Secondly, I shopped in the city instead of on the outskirts, so I had to pay a bit of a premium (depending on where I shop, sales tax can be as high as 9.8%, and it turns out even food is taxed here … I think its around 4%?). So where do we go from here? For me, the week’s worth of produce that I had all to myself forced me to eat real food every day. Instead of having nachos and cheese for dinner, I had to eat the fennel and cucumber and tomatoes and collard greens before they went bad. I admit, I didn’t get through everything by myself in the one week. Some of the stuff I stored in the freezer (shredded my zucchini and stored it in freezer bags for future bread!). But for the most part, it all went down my gullet. I realized, reflecting on the last week, that most of my meals were vegetarian, some were even vegan. I got a lot more creative with my meals, ate nuts and used olive oil in nearly every meal, and didn’t spend any money during the week by going out to lunch or grabbing a snack from the bookstore. And, as an extra bonus, I felt great all week. I felt sustained. My meals were filling, but not gigantic mounds of noodle and meat. In fact, I only had meat once during the week. I learned that I like fennel, and I like cooking with spices. I learned that I can make time to cook but I can also cook enough for myself to have leftovers to sustain me for the busier days. In other words, in the past week, I’ve really learned a lot about food, and myself. It got me thinking more (oh boy, who needs that?!). It got me thinking about other cool things to try and what sort of plan I’m going to have every time I go to the grocery store. Yeah, I probably am not going to buy all-organic all-the-time. Unfortunately, I can’t afford it. 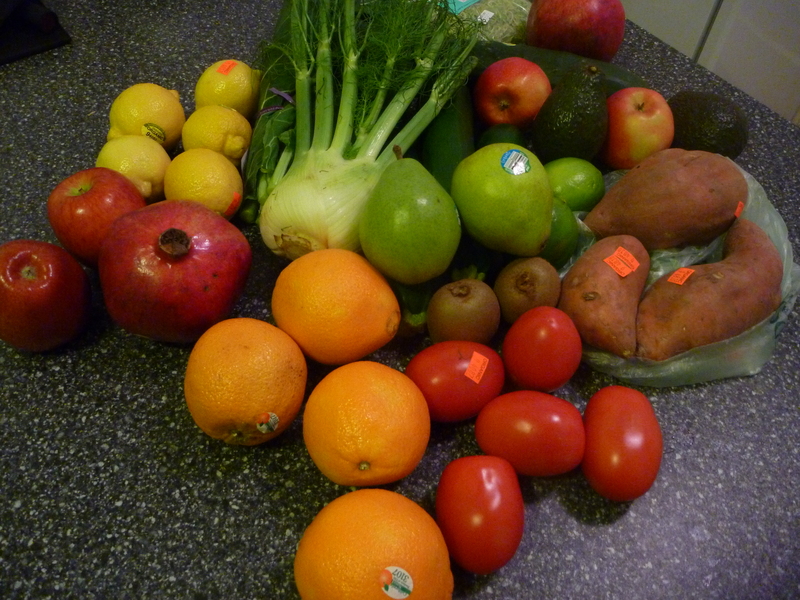 But I am going to continue my habits of buying mostly in-season foods that don’t travel far. I also got thinking about another cool challenge: see how far our foods travel from the farm to the table. People have done this, they’ve written books about it. But something like this nationally, or even globally, might tell a better story as to why food is more expensive in some cities than others. Donna, all the way from the UK! And thanks to everyone who spread the word and thank you to those who thought about what they were throwing in their cart at the grocery store. Also, thanks to Whole Foods Galleria for being convenient and friendly, and for having everything I needed to complete my list. Did I mention that, this weekend – after eating clean for an entire week – I finished off my sweet potatoes with a (rather large) side of nitrite-free bacon and farm fresh eggs from Whole Foods? I love their meat counter folks. I think everyone has “that food”- the one that brings about incredible memories and overwhelms the senses, not just the scent and taste of the food, but the emotional sense as well. Just the smell reminds one of a special day, a special place, or being surrounded by special company. My favorite comfort food is chruscikis. As a child, they were a treat only to be savored on Christmas Eve. And rightfully so. They weren’t easy to make; in fact, I never knew how to make them exactly, and I’d wait patiently outside the kitchen of my best friend’s grandmother’s house for them to be shared. 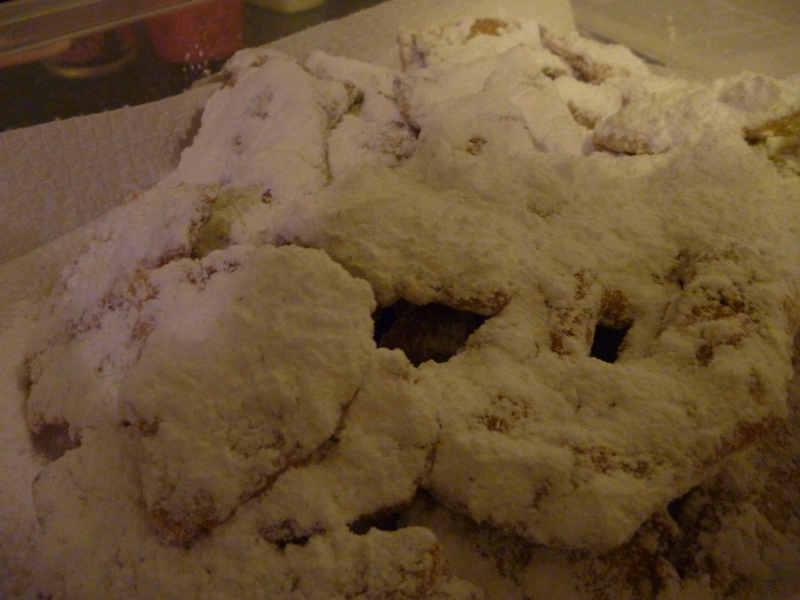 Granted, I was six or seven, and deep frying dough was a little advanced for me. But nonetheless, it felt like midnight by the time the chruscikis made their way to the table. The treat was always the most memorable part of the evening for me. Their shape alone was fascinating; somehow, someone (my best friend’s grandma, of course) weaved the thin dough in and out of itself to create this wing-shaped treat (not surprisingly, chrusciki means “angel wings” in Polish). The crisp dough, fried to a golden brown, had bubbles that would cave in on themselves if I took a bite on top of one. 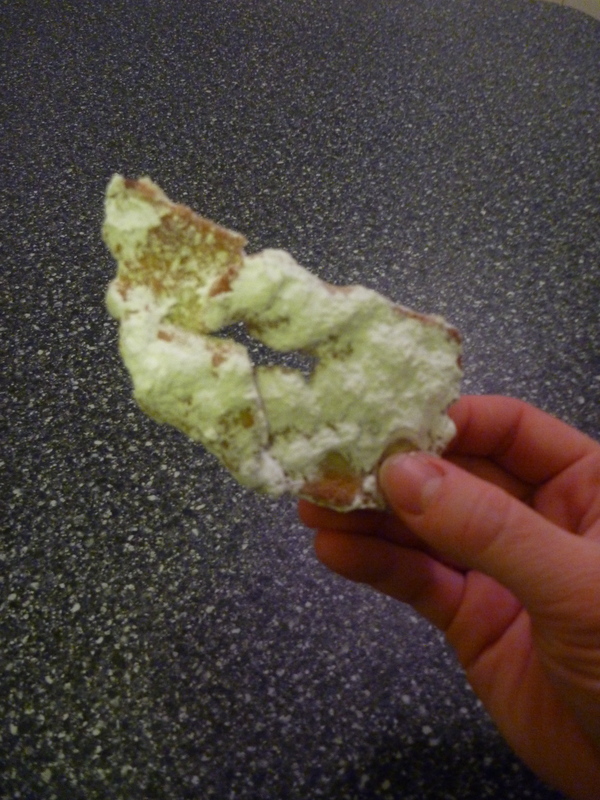 The treat was covered in white, fluffy powdered sugar, and the dough would break off by just pressing my lips ever-so-slightly together. It was so fragile; so delicate. The sugar and the bread would fill my mouth with sweet and salty flavors, and I’d sneak a few angel wings before my mom would bat my hand away, worried I’d go into a sugar craze like seven-year-olds do. I haven’t had chruscikis in years, mostly because Christmas Eve has not been celebrated in the same way as it was when I was pre-high school. And now that I follow a gluten-free diet, it was one of those treats that I buried and tried to forget about (like packzis and pierogies). But my boyfriend’s mom found a gluten free bakery that makes angel wings, and all the emotion I have tied to this magical food came flooding back. I knew that I needed to find a way to make these myself, so that once again, they could become a part of my new holiday traditions. I took a basic, not-gluten free recipe from online and modified it as best I could with what I had available. 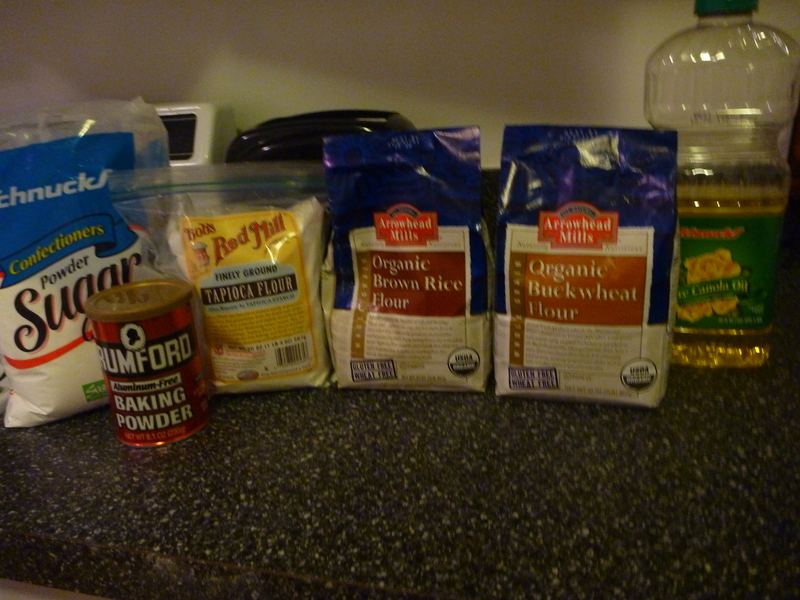 Mix together the flours and baking powder to make the flour blend. Make extra mixture for flouring surfaces. Beat the egg yolks in a stand mixer on medium speed until thick and then add the salt. Continue beating and add sugar and vanilla. Once mixed well, reduce speed of mixer to low and add in alternating ~1/2 c flour mix and 1tbsp cream until both are used up. Ball dough onto floured counter and let stand, covered with a towel, for 10min. Roll out with a rolling pin to very thin dough. Cut 1 to 2in wide strips about six inches long and then make a slit length-wise. Carefully weave one end of the strip through the slit to make the twist. Fry in canola oil (deeper than the thickness of the dough) until brown on both sides. 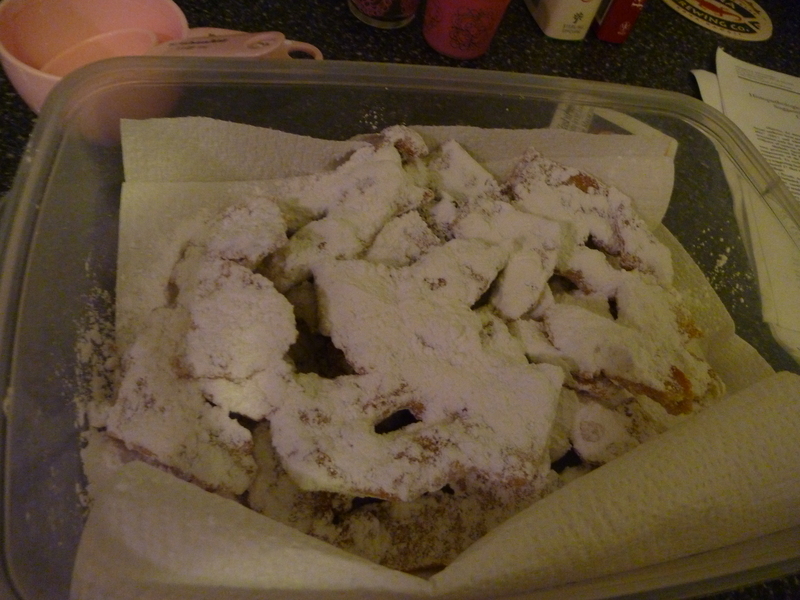 Let cool on cooling rack for about 3 min, and then cover in powdered sugar. For the past two years, I’ve had the most excellent hook-up: I was part of community-supported agriculture (CSA). My CSA was especially rad because the farmer charged ~$400/year, and delivered fresh fruit and veggies to my door every Tuesday. There were some things I loved, and some things I didn’t love so much, but regardless, having the seasonal fresh food at my dinner table helped me eat better and live more neutrally. This is what $38 in Organic veg delivered to your doorstep gets you from Door to Door Organics, thoughts? What would all this cost from my local grocery store? Certainly I could spend much less than $38, I thought. And, if I want it all organic, I’ll probably have the best luck at Whole Foods… (or as some people so aptly name it: Whole Paycheck- but for me, being gluten free, it doesn’t make a difference where I shop!). Then I thought about this: I live in a different metropolitan area than Sonja. Would the price of this real food be that much different city-to-city? @megankillian d2d organics is not local. It’s only local when it can be. I think it’s a tad cheaper than WF. @megankillian will do, I think I’m going to do the same, send ya an email in a sec, k? And so it began: The Real World Real Food Challenge. 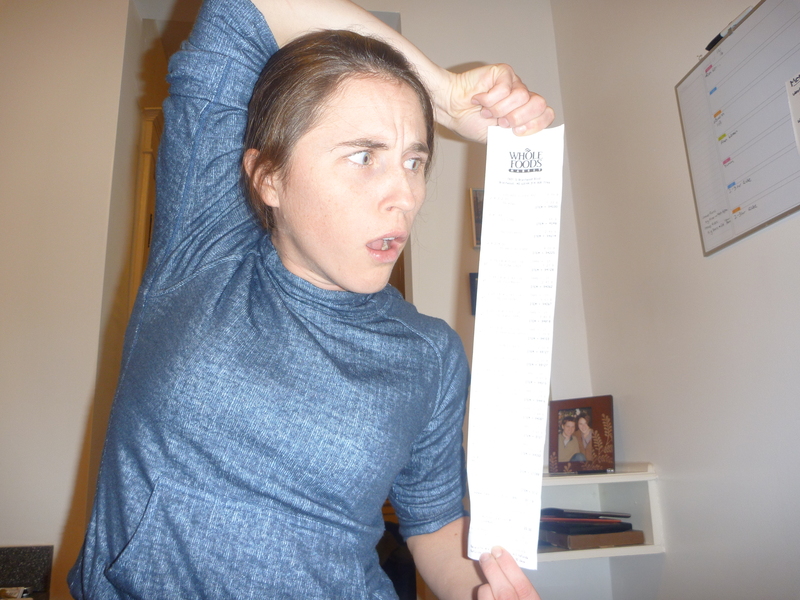 Sonja sent me the list, and five minutes later I set off to match her grocery list and check out without going over my budget of $38. With my list in hand, I headed to Whole Foods Galleria, which is one of two Whole Foods in the St Louis area (and the only one in the city limits, I think). 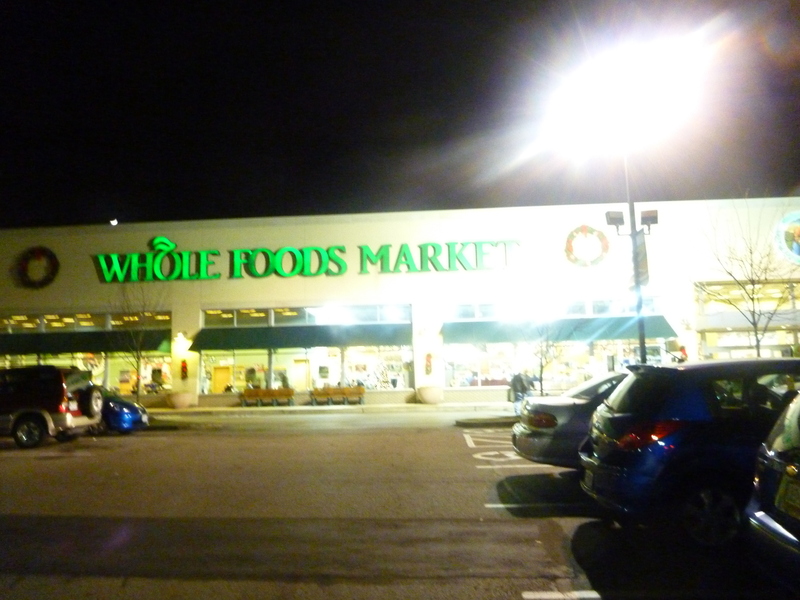 I chose Whole Foods because I really like Whole Foods, and I guessed that they would be the most likely store to have everything on the list in the organic variety. As a plus, I just love the atmosphere of the store, the smell of the deli and the bakery. Plus, the variety always compels me to explore my taste buds and try something a little exotic. But tonight, I had a plan. I felt like I was on a secret mission. The Hunt for Red October, only it was the Hunt for Red Roma Tomatoes. I didn’t have to wander too far, because everything I needed was in the front produce section. Duh. The zucchini squash, the fennel, even the collard greens (of which I’m not a fan… yet) found their way into my cart. But I was careful to grab the right amount (4 zucchini squash, one fennel with at least 4 stems, etc). I hit a speedbump, though, when it came to golden sweet potatoes. What are golden sweet potatoes, anyway? I am glad I had my Android, because I Google-Imaged that. And all I saw was a regular, ol’ sweet potato. So I grabbed three of the smallest sweet potatoes they had (organic) and moved along the list. In hindsight, it looks like I was a little off with that one, because my sweet potatoes don’t look the same… but anyway, I digress. 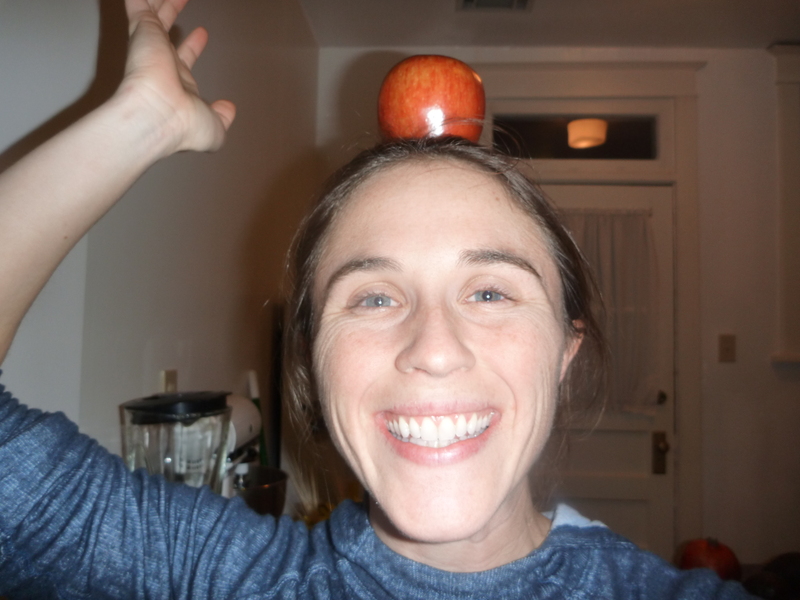 Moving along- breezily counting squash and kiwi and knocking on pomegranates, and then I hit the apples: pinova. What is that? Google phone to the rescue: It’s a cross between golden delicious, Cox’s orange pippin, and Duchess of Oldenburg. Never heard of it. And I couldn’t find them next to the braeburns or red delicious. So I asked the produce guy working and he told me they don’t have pinovas at this time. They had them a few weeks ago, and might get them again… but today, no goose. Dang. I asked him what would be the closest thing to a pinova, and he said the braeburn tastes similar. So I made an exception and grabbed two of these. There also weren’t any organic bean sprouts. I had bought them at Trader Joe’s, but Whole Foods just had “naturally grown” quasi-local (from Chicago) sprouts. So I grabbed a bag of what they had, and shrugged. Then I finally got to last thing on my list: limes. I found five organic lemons easily, but limes? Well, there were limes from Mexico, but they weren’t organic. There were key limes, but those weren’t organic either. Turns out, no organic limes at the Galleria Whole Foods on this trip. Uh-oh. This was a problem. I grabbed the regular old pesticide full limes and threw them into a bag. I made it to the checkout, thinking that I had no idea how I faired. Produce is hard to shop for if you’re on a budget, because you really can’t tell how much things cost unless you weigh everything out and allocate a certain percentage of your budget to purchasing it. And some things I expected to be cheap while others more expensive, but it always surprised me. Take the zucchini, for example. I would have guessed it to be a less expensive item, since it was marginally still in season and they grow like weeds. But it was the most expensive item on my receipt, coming in at $5.60 for 4. And the pomegranates, I assumed, would be redonkulously expensive, but they came in at $2.50 a pop. 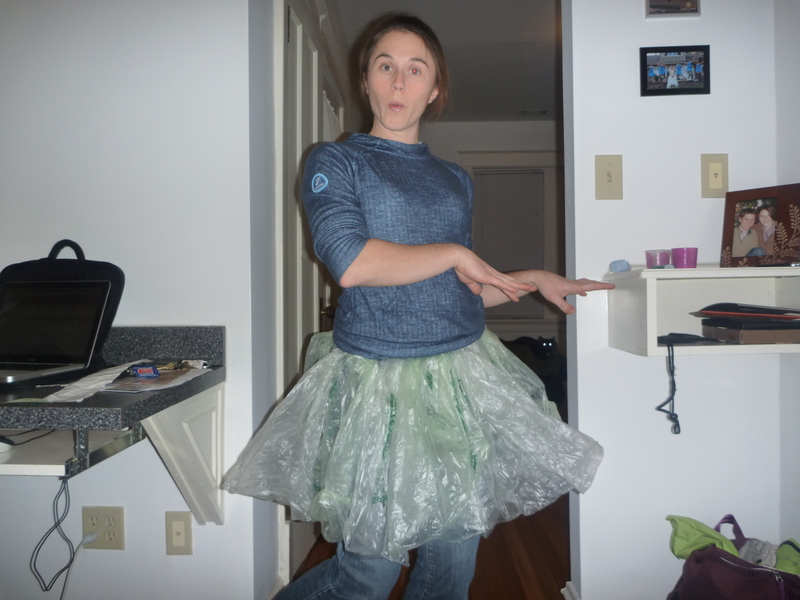 …although it looks more like a tutu than a hula skirt. It was quite the gorgeous shopping experience, though, I have to admit. I got all these beautiful, colorful, healthy, whole foods, just ready for me to eat them. And I don’t think I’ve ever bought five lemons at one time before. Or fennel. Or collard greens (someone please help me to like them). Sonja went out to price the stuff at her local Whole Foods in Denver, and her grand total came to $41.53. There is a discrepency between cities, so it appears. 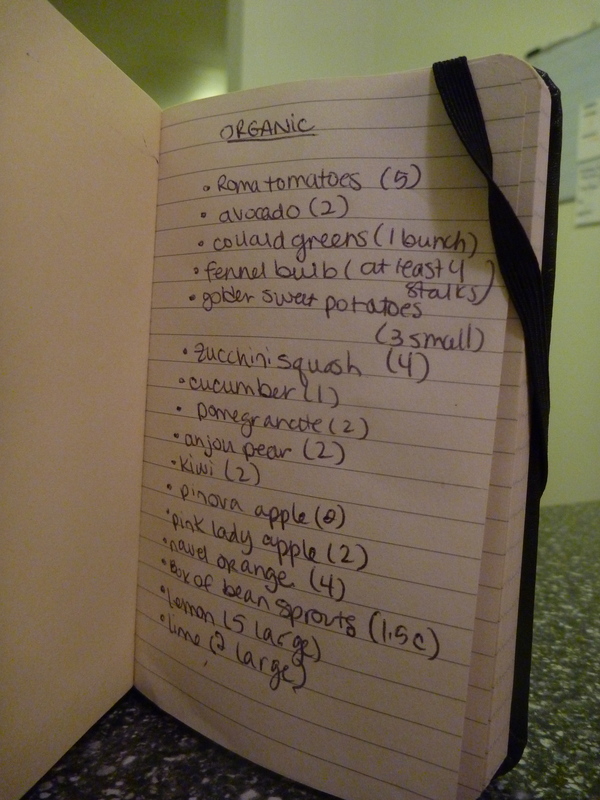 Although not everything from her list at Whole Foods was organic, she was well below my check-out total. I wonder why? I would have assumed things would be more expensive in the mile-hight city. So… now that you’ve seen all the fun I’ve had, do you wanna be a part of the Real World Real Food Challenge, too? Because you can! It’s super fun and exciting. 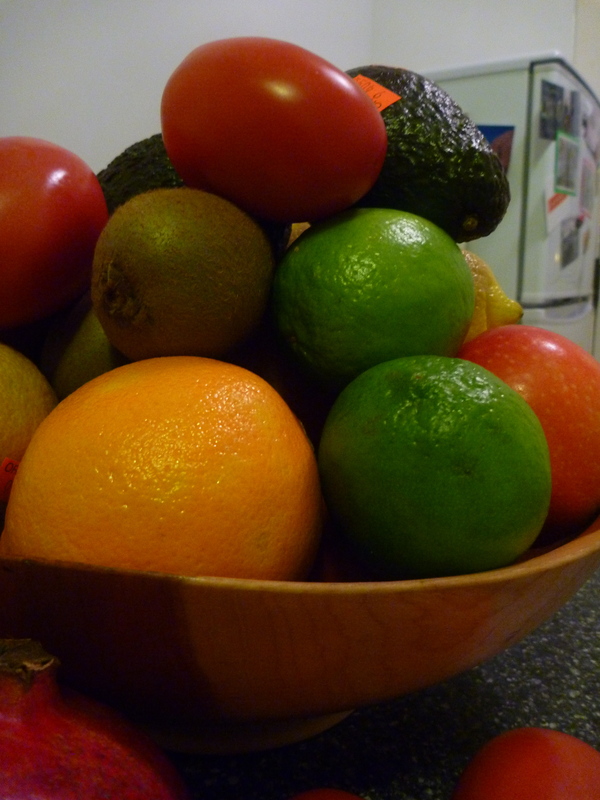 Just make sure you have $50 to spend on produce, and make sure that you’ll put it to good use (um, by eating it, silly! Not feeding it to your neighbor’s goats). Take the shopping list and head to your favorite grocery store where you can buy lots of organic and/or locally-grown vegetables and fruits. Buy only organic, and only what’s on the list. Sonja and I will even have a points system to determine who and where has the best real food available. Wanna try it but don’t wanna shell out for organic? That’s cool, too! We’re interested in how much it costs for regular-ol’ produce, too. Just remember, some things are healthier for you when they are organic than others (like apples, pears, tomatoes, and anything that you eat what is on the outside where the pesticides can soak in). Once you’ve done the shopping, share your story on your own blog, and make sure to tell one of us (or both!) the name of the store you shopped at and what city/metro area you live in. Share the link to your blog post with us, too (in the comments of our posts). 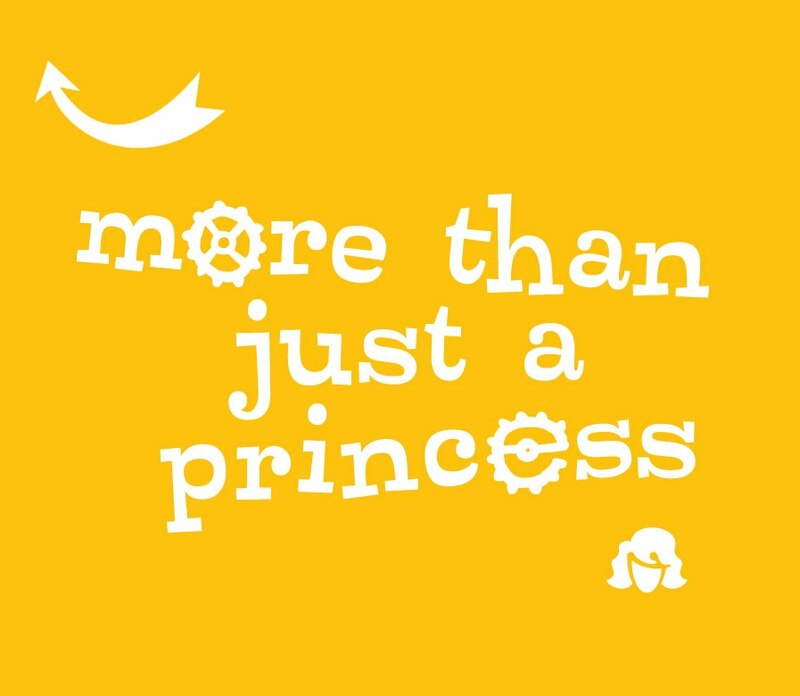 We’ll use the honor system, but share your grand total and any modifications (if you made any). Why do this? Because it’s fun! Interesting! A learning experience! Why else? Well, if you really want more motivation, we can give you a little incentive. How about a big ol’ blast of Justin’s Nut Butter? We’ll giveaway a big, sweet and tasty supply of our favorite nut butters to the person with the best blog post. We will be deciding the winner on December 20th, so you have a little over a week to get your groceries and post your blog. I’m moving to St Louis the day before Thanksgiving. But I’m still going to do-it-up-right. Thanksgiving is my favorite holiday! 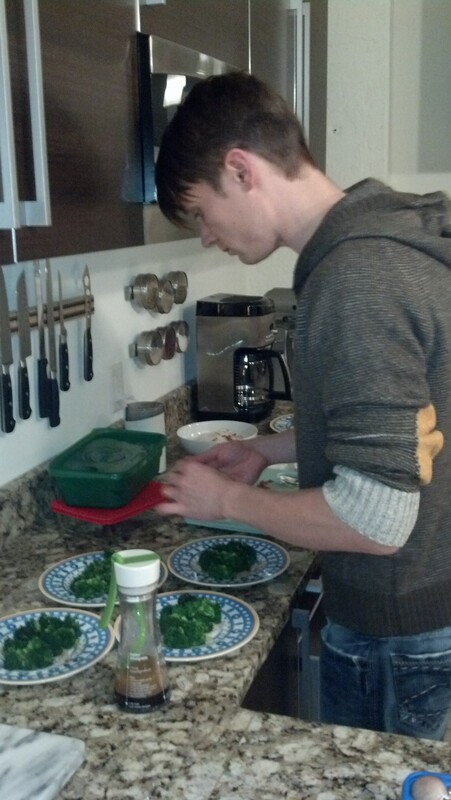 Plus, Baberaham will be there to help me cook for the first time in my new place. 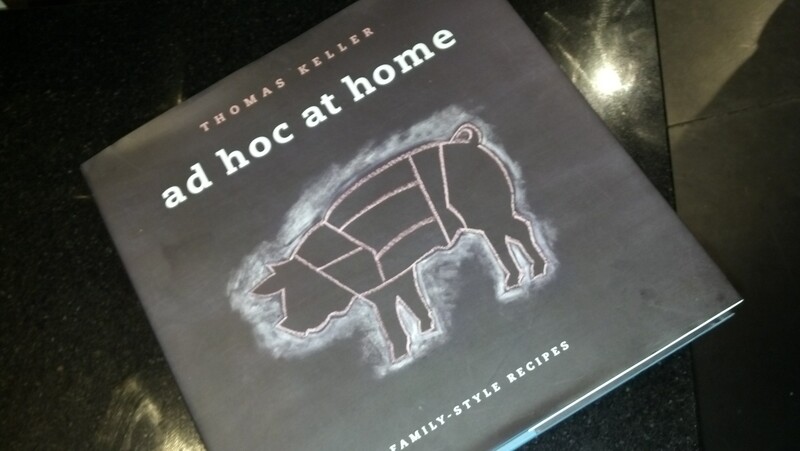 What better way to break in the kitchen than having a holiday meal? I promised him a pumpkin pie anyway. My mom has a great tradition of stocking up on snacks and handing them off to me when I see her. 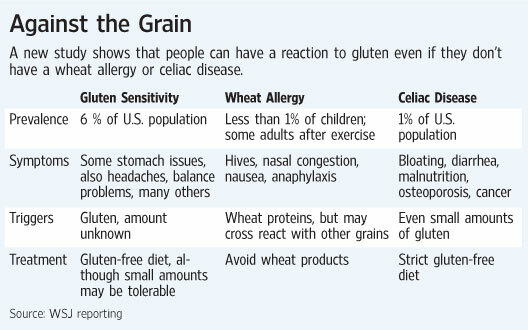 Since going gluten-free, she now buys just about anything that says “Gluten Free” on the label. Recently, Think Thin bars were on sale at Kroger, and she bought (literally) a box. I couldn’t be more impressed. Although I’m a (not-so-closet) fan of junk food like Snickers and peanut butter M&Ms, I have tried to cut back a bit on my junk food intake since my season break began. The first week was a little rough, since my dissertation was due, I was traveling a lot, and it was the week of Halloween. But, I have since got into a better habit of cooking more meals, eating oatmeal for breakfast, and having a veggie-full lunch. One thing that is hard for me, though, is making it through the day without having a snack. So, I took that box of Think Thin bars to school and stuffed them into my desk. Every time I eat one of these bars, I am reminded to think about what I am eating, because how we fuel ourselves is crucial to our health. Following a strict gluten-free diet, I sometimes find it a little more complicated to plan a perfectly balanced meal than when I wasn’t gluten-free. And, to be honest, sometimes french fries just sound good. But I have noticed that there are times when my diet lacks in the protein department, and then I go on a rampage for a nice, juicy steak. So, I’m excited that Think Thin bars have plenty of protein to make me feel full, and of course, satisfy my sweet tooth. Plus, the protein in these products is from whey, casein, and soy, which is a great mixture for muscle recovery. My favorite flavor is the creamy peanut butter, but the cookies and cream brings back memories of Oreos (that I oh-so-miss). So next time, instead of reaching for a Snickers, I’m going to reach for a Think Thin bar. Since I have a case of these bad boys, and they taste pretty darn good! With my bi-weekly buy-in of community supported agriculture, I got a lot of squash. I love squash, but Baberaham isn’t such a fan. Nonetheless, I’ve found these delicious fruit easy to prepare. As a bonus, if you are to buy squash from a grocery store or farmer’s market, it’s pretty stinkin’ cheap. I halved the acorn squash, saved the seeds, set the squash on a cookie sheet insides up, and baked them at 375F for 30 minutes, and then an hour at 350F. 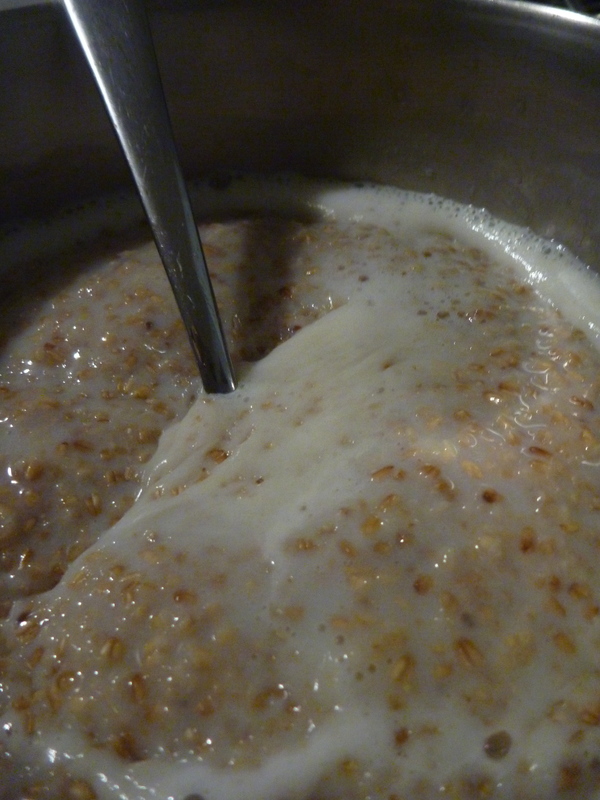 After dropping the temp on the oven for the squash, I started cooking the oats with 1c water and 1c skim milk to make them a little creamy. Once the oats and squash were done (I could tell the squash was done by the “fork test”- when the fork goes in easy, its done! 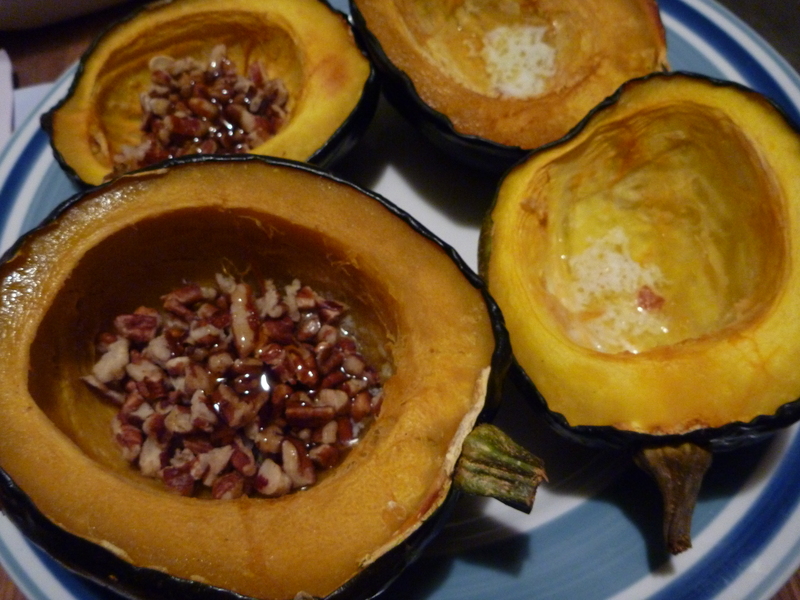 ), I laid the squash insides-up on a plate and covered the inside with chopped pecans (about 2tbsp for each half). Then, I drizzled about 1/2 tbsp of honey on the pecans. 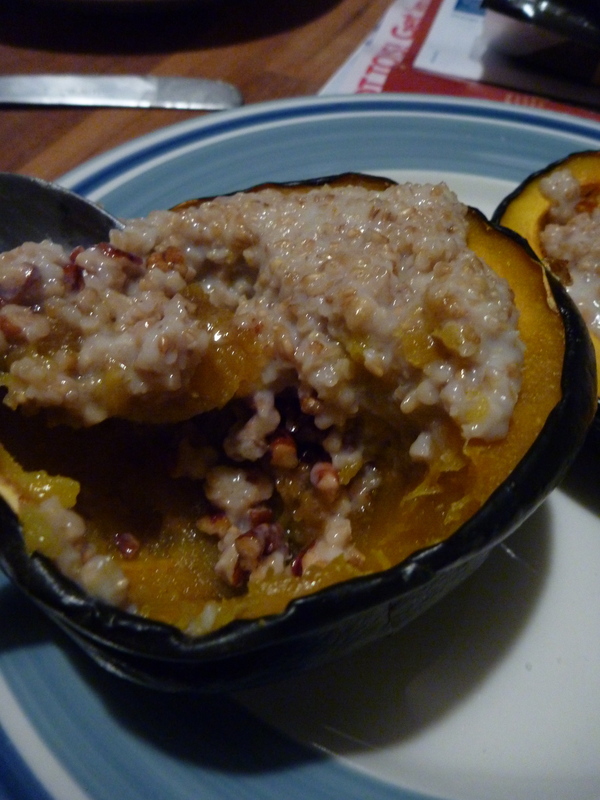 After adding the pecans and honey, I filled the squash halves to the brim with hot oats. That’s it! Eating it from the outside in is the best way to get all the flavors. Each bite should contain some squash, oats, and pecans. The slight sweetness of the honey blended with the sea salt makes this dish irresistable (at least, to me!). I eat big, so this was enough for two meals in my eyes. But, if you want to divvy up the calories, it could feed four. Let me know if you try this dish! Edit: OH YEAH! I forgot to add… I made pepitas out of the leftover seeds. Traditionally, pepitas are made from pumpkin seeds, but to be honest, acorn squash seeds taste just the same. There are fewer seeds, but why let ’em go to waste? 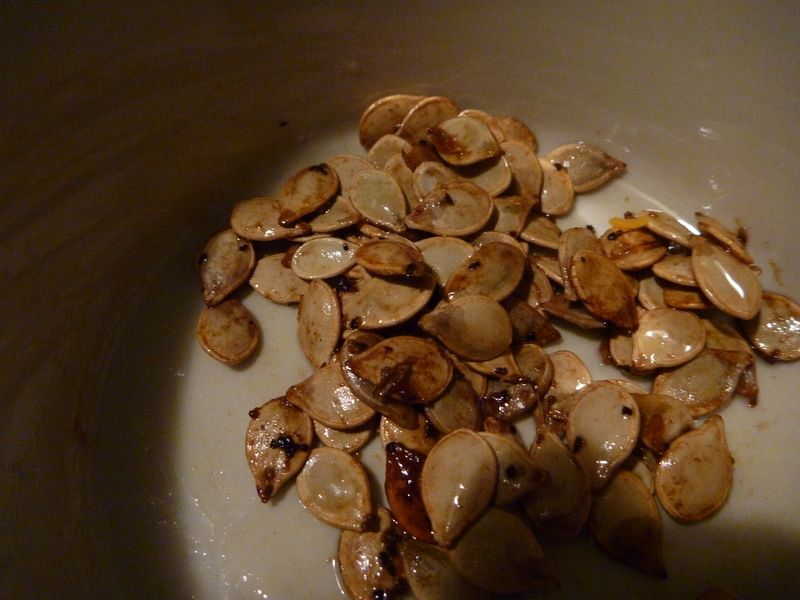 I just peeled away the “gunk”, put them in a bowl, sprinkled them with sea salt, pepper, and 2 tbsp olive oil, and then baked them at 350F for ~5-10 minutes- while I was preparing the oatmealed squash. Once they started to brown and swell a very small amount, I knew they were done. Delish! I feel very fortunate to have completed my 2010 “A” race, the Rev3 FullRev at Cedar Point, before taking on all of the traveling craziness of interviewing for a post-doc position. Not because traveling is stressful (even though it is), but because my diet gets wrecked when I travel. Of course, my warm-up to this foodie binge was a trip to Madison, Wisconsin, where I ventured to for an interview around the time I was beginning to taper. Of course, I had to hit up Bluephies and the Silly Yak Bakery, which meant plenty of delicious gluten-free goodies that filled my comfort food quota. Then, my trip to Cedar Point meant pre-race ice cream, and post race whatever-the-eff-I-wanted. But now, I have no concerns about upcoming races (my next isn’t for another four weeks) or how I’ll feel for workout #2 in a few hours (because there isn’t one). One thing I am concerned about is the number of calories I take in when I don’t have anything to plan on. Does that sound good? Then I will probably eat it. And, one thing I’ve noticed since traveling for interviews this week is that whenever anyone talks about how awesome their locale is and why I should live there, it always gets directed at food. Pretty sure this isn’t a good thing. You see, in Houghton, there are basically three restaurants I go to on a regular basis. One is a Tex-Mex place that has fast service close to campus, but its close to campus… and I like to avoid that place when I can. The other is a pizza place that makes a mean gluten-free crust, but its expensive. And the third is the slowest service you could ever imagine with mediocre American food. Needless to say, I don’t go out that often. But if I have variety, I gotta try it out. For example, I had bacon, eggs, and potatoes at a diner near my hotel this morning, because that is my favorite breakfast and I have to compare it to the MUB score of awesomeness*. For lunch, I was treated to an Indian buffet (which was awesome, by the way). Buffets are always bad news bears, because as a grad student, I feel like I have to get my money’s worth; and as an athlete coming off from race week, I feel like I can still eat a dinosaur. Needless to say, I was stuffed. But not too stuffed to turn down FroYo. St Louis is hot, and FroYo is not. Take some mango tart fro-yo and add some fresh fruit and shazam! you’ve got an awesome air conditioner. And did someone say pizza? Pi Pizzeria in Central West End is amazing, the service is phenomenal, and they even have gluten free pizza. Guess what? It’s awesome. I ordered the Central West End pizza, not just because I was in CWE, but also because it was made with goat cheese and arugula. I love arugula. And, just when I thought I was too full, the server handed over the dessert menu, and *gasp! * there was Askinosie chocolate ice cream on the menu. And *double gasp! * its better than my homemade chocolate ice cream. Of course it was, because Askinosie is to.die.for. Here’s hoping for some nutritious salads tomorrow? I am eating like I just raced an Ironman yesterday, and I need to slow my role before I become a rollie-pollie. But, I also need to “absorb the culture”- so one more day of this foolish behavior shouldn’t hurt! *I love MUB breakfast… when Andrea makes it.